One evening earlier this week, the sky was full of puffy clouds and the air clear and it looked like we would have a nice sunset. So I dressed up in my coveralls and boots – that’s right folks, I’m still wearing my winter get-up, and Old Man Winter, you’re on notice, I’m not taking your crap anymore. Let this serve as your official eviction notice. 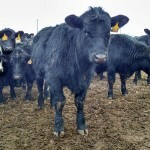 So I headed out into the pasture and sat down in a clean spot and took pics of the calves and cows and the puffy clouds. The wind was blowing out of the north and when I could no longer bend my cold fingers I started to head in. Until this caught my eye. “Oh no, that cow is pushing that calf around”, I thought. 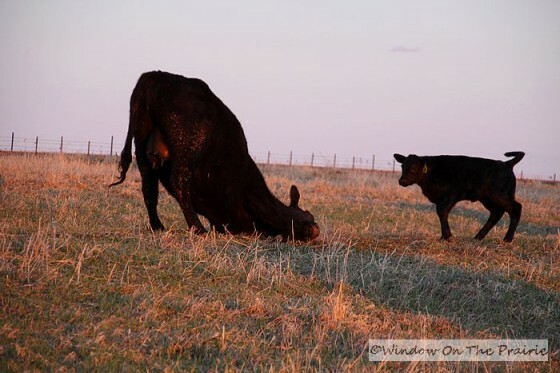 Cows do this if the calf is not their own. The calves would like to nurse from anything with an udder, but the cows aren’t having it. The milk bar is open only to their own kid. 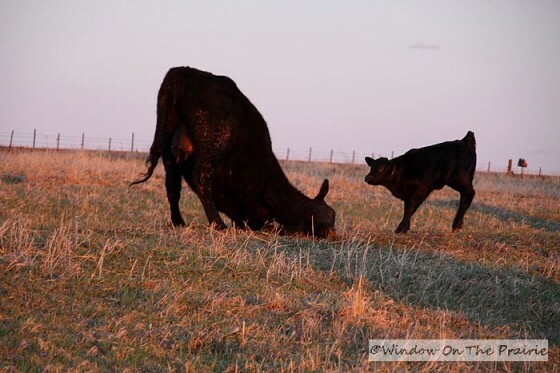 Until it went on for a while, and I finally realized that the calf was her own and she was playing with him. They were playing the shoving game. 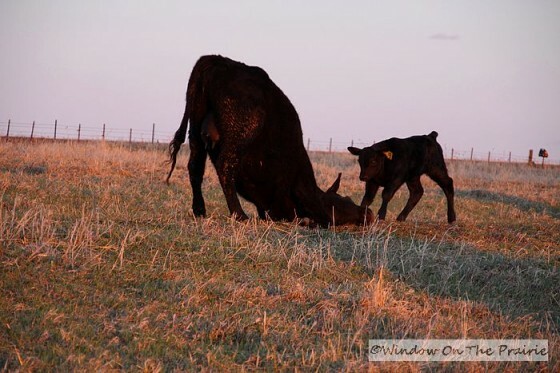 Calves do these with each other a lot, but I’d never seen a cow in a shoving match with her calf. She was being careful not to overpower her little squirt too. And if that wasn’t cute enough, then she did this. Like a large dog playing with a puppy, she lowered her head down on the ground. 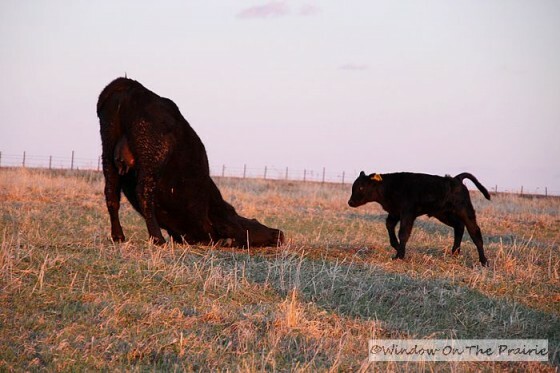 Her calf thought this was the funniest thing ever and he frisked about her with pure joy. Finally, she got back to her feet. And playtime was called on account of supper. Now that is totally cute! I’ve never seen adult cows play like that. Is this a first time mom or an older mom with lots of mothering experience? 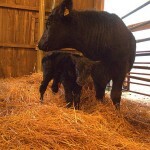 Yes, she is a first time mom. She is only 2 years old, and so in cow years she’s just a teenager herself. Oh, my goodness!!! That must have been a spectacularly wonderful sight! I’ve never seen or heard of a cow doing that, either. Hope you’ll get some warm weather soon. We’ve been very warm but with this last front, things have cooled off for a couple of days. Was 44 degrees this morning when we got up. Yeah, Yeah, I know. You’d LIKE to have 44 degrees when you wake up. What a lovely spectacle !~! 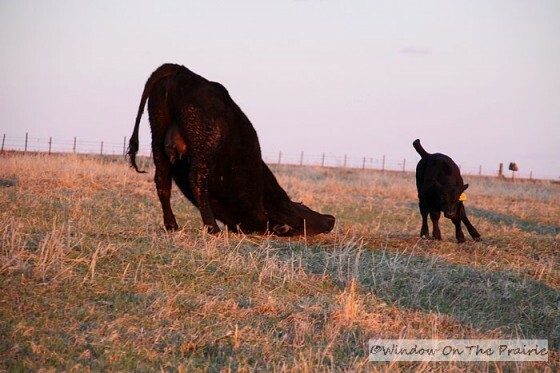 The “play bow” from a momma cow-not something I have ever seen or heard of before-you are so lucky to have caught it on film. 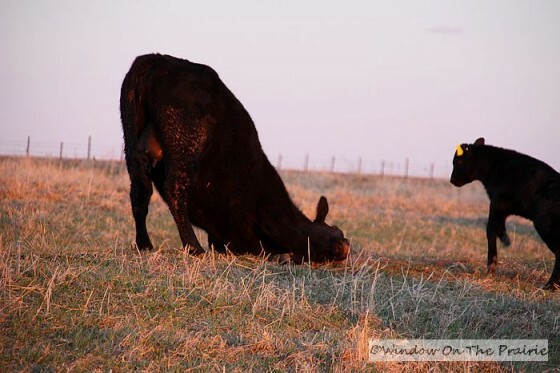 Dogs and cats exhibit this behavior in order to draw a playmate but for a cow-wow ! I love it, I am sending the link to several of my friends. Thanks for posting it, Suzanne. How sweet is that Momma? I just can’t get over it. It is nothing I have ever seen before.I guess I never thought cows played. None the less they are great pics, good job! Those pictures (and those cows) are so cute! this is precious! 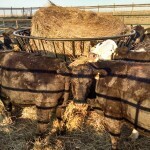 we had older cows; all about the duty there; breed, birth, feed, wean. hope you get to see more of this; just keep the camera handy! 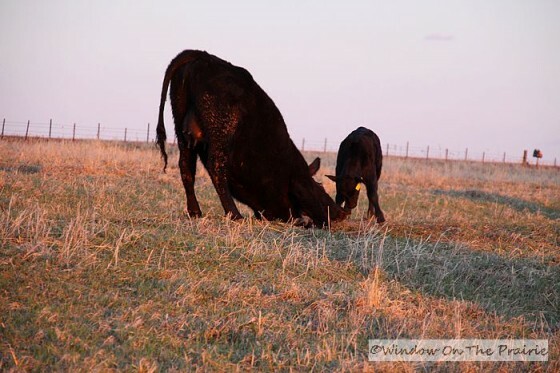 Most of our cows are ho hum always down to business too, but this cow and the others in her pasture are all first calvers and tend not to be so serious. So glad I could catch it on “film” . Oh, that is adorable!!! 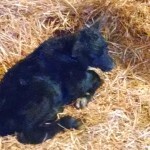 I was smiling from the first picture of that Mama Cow with her head down on the ground. So cute. Aren’t you SO glad you had your camera?! Oh, what a wonderful moment to have seen. So very cute and that baby just jumping with joy around mama. I’m another one that has never seen anything like this but, sure would love too. Thanks for sharing. Amen on the winter wear!!!! That made me laugh so hard I was crying. Try getting 4 kids plus yourself ready for chores. The whole process takes all of us about a half hour. We are so excited for Spring we just about can’t stand it. 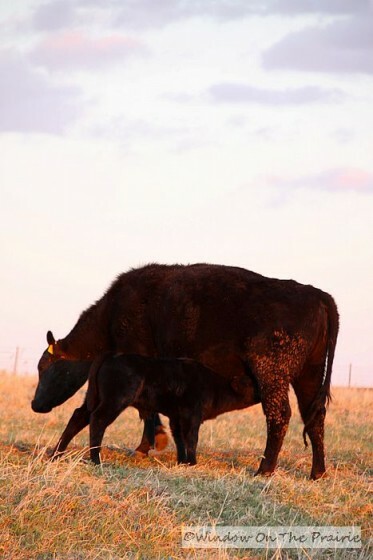 We loved your cow calf pictures. 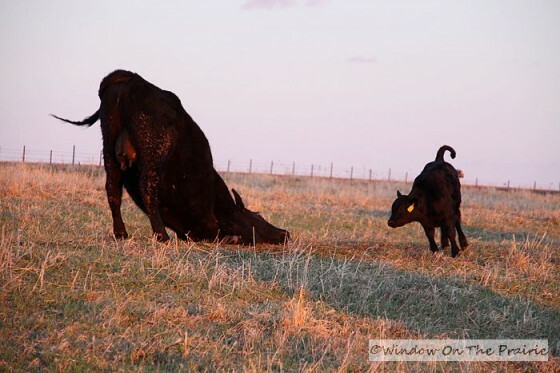 Calves are so fun to have on the farm. We raise Irish Dexters and everyone of them is a member of the family. What breed do you guys raise? We have Angus too but like the personality and easy keep of the Dexters. Love your site, specially the Herd section. oh my, I hate dressing myself in the winter get up – I don’t even want to think about 4 kids as well. You should have a party the last day you have to wear all that, that is if it ever warms up enough. Argh. 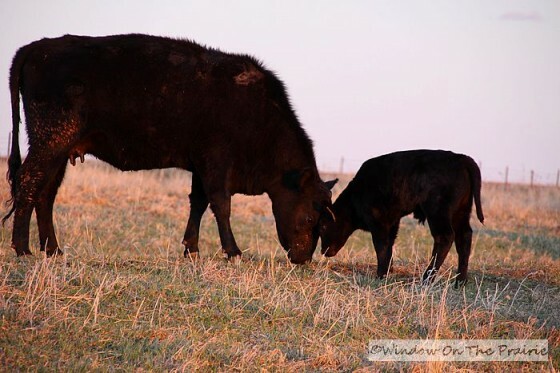 We have Angus cattle, and used to have Hereford. Not familiar with Dexters, but if they are calmer than the homicidal Angus, I’m all for them. I just paid a visit to your site at http://mapleviewfarmdexters.blogspot.com/. I just love it! Wonderful posts. WOW what an awesome thing to have seen! 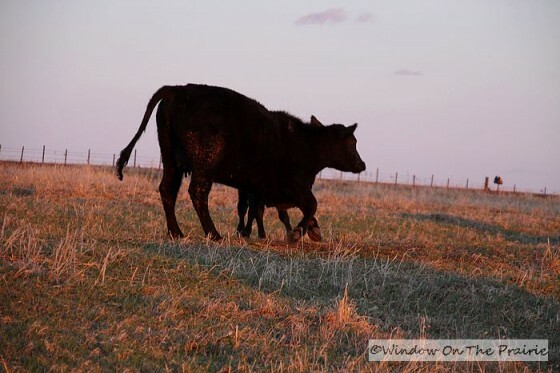 In all my life on the farm I’ve never seen a mama cow play with her baby like that. You may never witness that again. That is so cute! 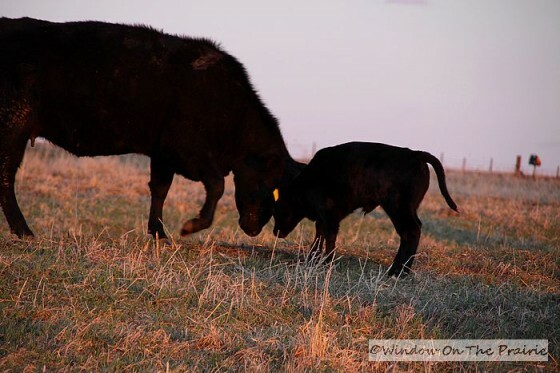 I love watching the calves play with their moms. My ox (all 3000 pounds) will play push with the kids and be just as gentle as can be! Aren’t they just the greatest family focused animals! 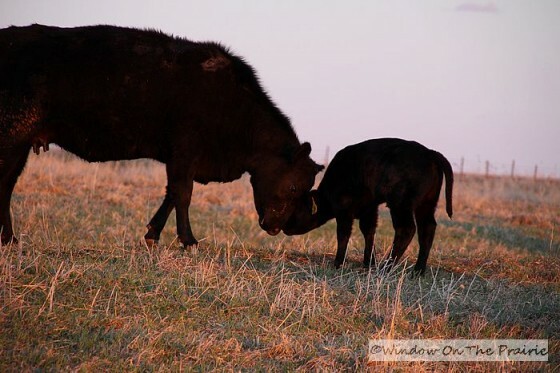 Awwww…that’s so sweet about your Ox. Oh my goodness!!!!! I love that! That is the sweetest thing! 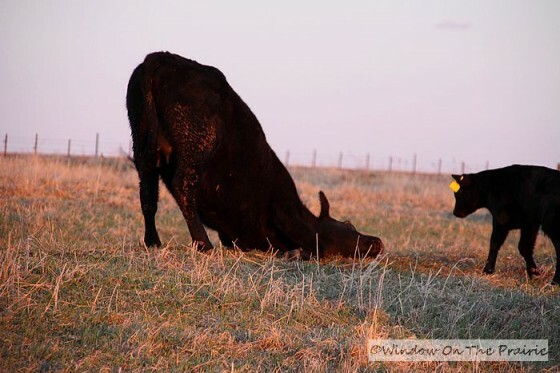 I can’t believe that momma cow was able to bend down and lay her head down like that…that is so cool. How sweet is that! Thanks for sharing such an awesome event. Too cute, I’ve never seen a cow do this! 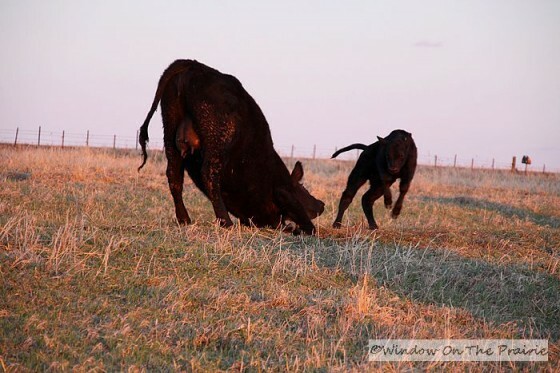 I have seen full grown cows play like calves though and you’re right, they remind me of dogs!